When the borrower stops paying interest or principal on a loan, the lender will lose money. Such a loan is known as Non-Performing Asset (NPA). Indian Banking industry is seriously affected by Non-Performing Assets. In the best interest of our readers, we have come up with a comprehensive post on NPAs, in which analyze the entire issue in detail. We will also list out the entire steps taken by Government and RBI to counter the situation. What is a Non-Performing Asset (NPA)? You may note that for a bank, the loans given by the bank is considered as its assets. So if the principle or the interest or both the components of a loan is not being serviced to the lender (bank), then it would be considered as a Non-Performing Asset (NPA). Any asset which stops giving returns to its investors for a specified period of time is known as Non-Performing Asset (NPA). Generally, that specified period of time is 90 days in most of the countries and across the various lending institutions. However, it is not a thumb rule and it may vary with the terms and conditions agreed upon by the financial institution and the borrower. Suppose the State Bank of India (SBI) gives a loan of Rs. 10 crores to a company (Eg: Kingfisher Airlines). Consider that they agreed upon for an interest rate of say 10% per annum. Now suppose that initially everything was good and the market forces were working in support to the airline industry, therefore, Kingfisher was able to service the interest amount. Later, due to administrative, technical or corporate reasons suppose the company is not able to pay the interest rates for 90 days. In that case, a loan given to the Kingfisher Airlines is a good case for the consideration as NPA. An asset, including a leased asset, becomes non­performing when it ceases to generate income for the bank. Interest and/ or instalment of principal remain overdue for a period of more than 90 days in respect of a term loan. The instalment of principal or interest thereon remains overdue for two crop seasons for short duration crops. The instalment of principal or interest thereon remains overdue for one crop season for long duration crops. Substandard Assets An asset which remains as NPAs for less than or equal to 12 months. Doubtful Assets An asset which remained in the above category for 12 months. Loss Assets Asset where loss has been identified by the bank or the RBI, however, there may be some value remaining in it. Therefore loan has not been not completely written off. More than Rs. 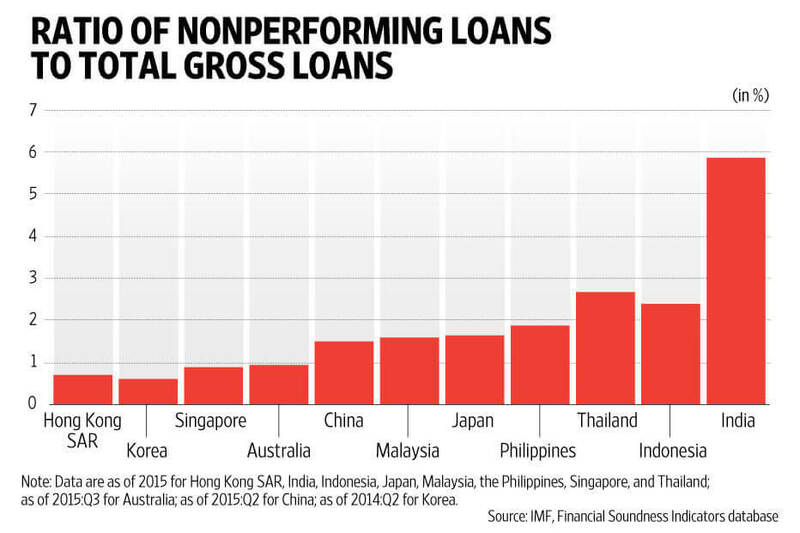 7 lakh crore worth loans are classified as Non-Performing Loans in India. This is a huge amount. The figure roughly translates to near 10% of all loans given. This means that about 10% of loans are never paid back, resulting in substantial loss of money to the banks. When restructured and unrecognised assets are added the total stress would be 15-20% of total loans. 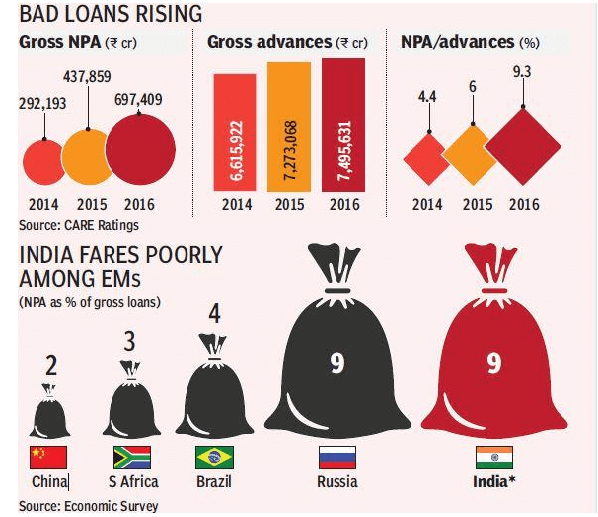 NPA crisis in India is set to worsen. Restructuring norms are being misused. This bad performance is not a good sign and can result in crashing of banks as happened in the sub-prime crisis of 2008 in the United States of America. Also, the NPA problem in India is worst when comparing other emerging economies in BRICS. What can be the possible reasons for NPAs? Busines losses due to changes in business/regulatory environment. Lack of morale, particularly after government schemes which had written off loans. Global, regional or national financial crisis which results in erosion of margins and profits of companies, therefore, stressing their balance sheet which finally results into non-servicing of interest and loan payments. (For example, the 2008 global financial crisis). The general slowdown of entire economy for example after 2011 there was a slowdown in the Indian economy which resulted in the faster growth of NPAs. The slowdown in a specific industrial segment, therefore, companies in that area bear the heat and some may become NPAs. Unplanned expansion of corporate houses during the boom period and loan taken at low rates later being serviced at high rates, therefore, resulting in NPAs. Due to mal-administration by the corporates, for example, willful defaulters. Due to misgovernance and policy paralysis which hampers the timeline and speed of projects, therefore, loans become NPAs. For example the Infrastructure Sector. Severe competition in any particular market segment. For example the Telecom sector in India. A bad lending practice which is a non-transparent way of giving loans. Due to natural reasons such as floods, droughts, disease outbreak, earthquakes, tsunami etc. Cheap import due to dumping leads to business loss of domestic companies. For example the Steel sector in India. Lenders suffer a lowering of profit margins. Higher interest rates by the banks to maintain the profit margin. Redirecting funds from the good projects to the bad ones. In the case of public sector banks, the bad health of banks means a bad return for a shareholder which means that the government of India gets less money as a dividend. Therefore it may impact easy deployment of money for social and infrastructure development and results in social and political cost. Investors do not get rightful returns. NPAs related cases add more pressure to already pending cases with the judiciary. What are the various steps taken to tackle NPAs? NPAs story is not new in India and there have been several steps taken by the GOI on legal, financial, policy level reforms. In the year 1991, Narsimham committee recommended many reforms to tackle NPAs. Some of them were implemented. To decrease the time required for settling cases. They are governed by the provisions of the Recovery of Debt Due to Banks and Financial Institutions Act, 1993. However, their number is not sufficient therefore they also suffer from time lag and cases are pending for more than 2-3 years in many areas. A good information system is required to prevent loan falling into bad hands and therefore prevention of NPAs. It helps banks by maintaining and sharing data of individual defaulters and willful defaulters. They are helpful in tackling and recovery of small loans however they are limited up to 5 lakh rupees loans only by the RBI guidelines issued in 2001. They are positive in the sense that they avoid more cases into the legal system. It provides a simple mechanism for recovery of NPA for the advances below Rs. 10 Crores. It covers lawsuits with courts and DRTs (Debt Recovery Tribunals) however willful default and fraud cases are excluded. Control over the management of the borrowing concern. Appoint a person to manage the concern. Further, this act has been amended last year to make its enforcement faster. The RBI gave license to 14 new ARCs recently after the amendment of the SARFAESI Act of 2002. These companies are created to unlock value from stressed loans. Before this law came, lenders could enforce their security interests only through courts, which was a time-consuming process. It is for reducing the burden of the debts on the company by decreasing the rates paid and increasing the time the company has to pay the obligation back. Also known as, Flexible Structuring of Long Term Project Loans to Infrastructure and Core Industries. It was proposed to maintain the cash flow of such companies since the project timeline is long and they do not get the money back into their books for a long time, therefore, the requirement of loans at every 5-7 years and thus refinancing for long term projects. It was created by the inclusion of all PSBs whose loans have become stressed. It is present so as to avoid loan to the same individual or company from different banks. It is formulated to prevent the instances where one person takes a loan from one bank to give a loan of the other bank. 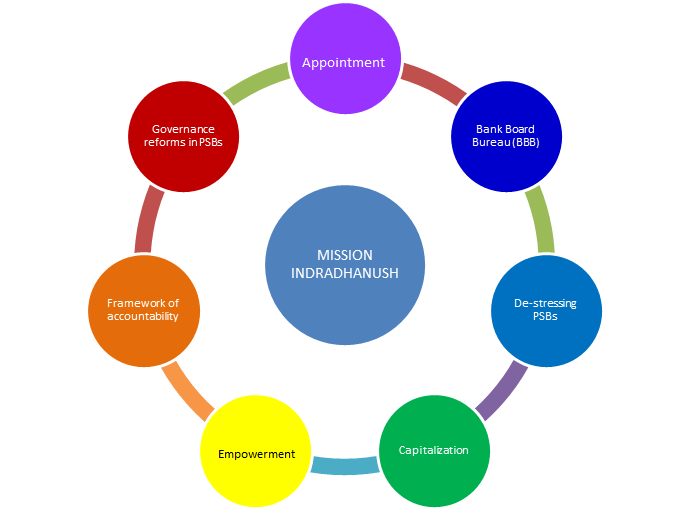 The Indradhanush framework for transforming the PSBs represents the most comprehensive reform effort undertaken since banking nationalization in the year 1970 to revamp the Public Sector Banks (PSBs) and improve their overall performance by ABCDEFG. A-Appointments: Based upon global best practices and as per the guidelines in the companies act, separate post of Chairman and Managing Director and the CEO will get the designation of MD & CEO and there would be another person who would be appointed as non-Executive Chairman of PSBs. C-Capitalization: As per finance ministry, the capital requirement of extra capital for the next four years up to FY 2019 is likely to be about Rs.1,80,000 crore out of which 70000 crores will be provided by the GOI and the rest PSBs will have to raise from the market. D-DEstressing: PSBs and strengthening risk control measures and NPAs disclosure. E-Employment: GOI has said there will be no interference from Government and Banks are encouraged to take independent decisions keeping in mind the commercial the organizational interests. F-Framework of Accountability: New KPI(key performance indicators) which would be linked with performance and also the consideration of ESOPs for top management PSBs. G-Governance Reforms: For Example, Gyan Sangam, a conclave of PSBs and financial institutions. Bank board Bureau for transparent and meritorious appointments in PSBs. 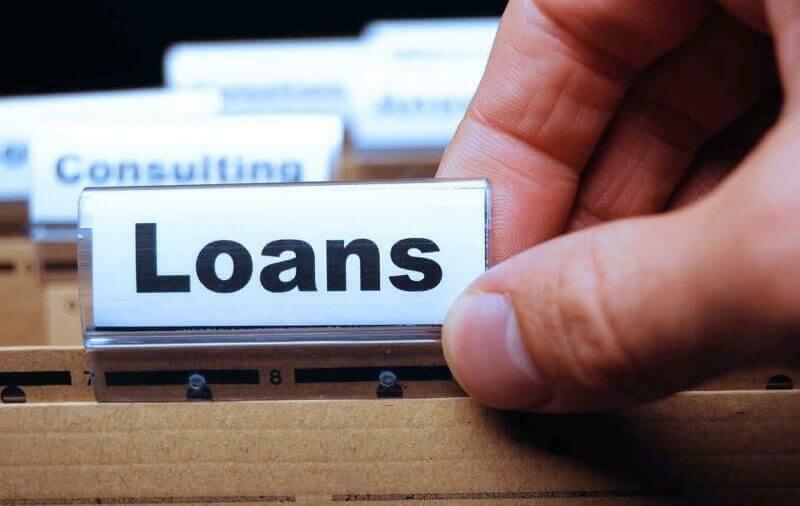 Under this scheme banks who have given loans to a corporate borrower gets the right to convert the complete or part of their loans into equity shares in the loan taken company. Its basic purpose is to ensure that more stake of promoters in reviving stressed accounts and providing banks with enhanced capabilities for initiating a change of ownership in appropriate cases. Classify stressed assets and provisioning for them so as the secure the future of the banks and further early identification of the assets and prevent them from becoming stressed by appropriate action. It has been formulated as an optional framework for the resolution of largely stressed accounts. It involves the determination of sustainable debt level for a stressed borrower and bifurcation of the outstanding debt into sustainable debt and equity/quasi-equity instruments which are expected to provide upside to the lenders when the borrower turns around. It has been formulated to tackle the Chakravyuaha Challenge (Economic Survey) of the exit problem in India. The aim of this law is to promote entrepreneurship, availability of credit, and balance the interests of all stakeholders by consolidating and amending the laws relating to reorganization and insolvency resolution of corporate persons, partnership firms and individuals in a time-bound manner and for maximization of value of assets of such persons and matters connected therewith or incidental thereto. This debate is recently in the news which is about the idea of a Public Asset Reconstruction Companies (ARC) fully funded and administered by the government as mooted by this year’s Economic Survey Vs. the private ARC as advocated by the deputy governor of RBI Mr. Viral Acharya. Economic survey calls it as PARA (Public Asset Rehabilitation Agency) and the recommendation is based on a similar agency being used during the East Asian crisis of 1997 which was a success. Economic survey 16-17, also talks about the formation of a bad bank which will take all the stressed loans and it will tackle it according to flexible rules and mechanism. It will ease the balance sheet of PSBs giving them the space to fund new projects and continue the funding of development projects. Technology and data analytics to identify the early warning signals. Mechanism to identify the hidden NPAs. Development of internal skills for credit assessment. Forensic audits to understand the intent of the borrower. This is “THE BASE” of Current economy, for technical background people. Please seen that pic frnd it has represented the correct form..